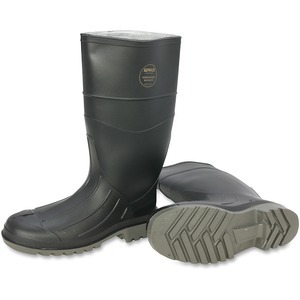 PVC injection-molded, steel-toe boots are completely waterproof to ensure your feet stay dry and comfortable. Flexible upper section provides excellent mobility for all-day comfort. Reinforced construction at the critical stress points provides durable, long-lasting use. Deep-angle cleat sole and heel enhance your grip to prevent slips and falls. Steel toe meets ASTM F2413-05 requirements.